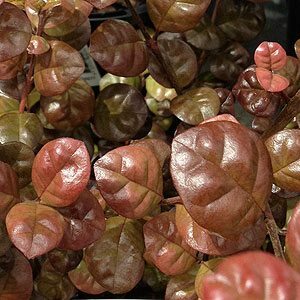 Used a screening plant or a medium sized hedge Lophomyrtus bullata with its blistered or crinkled purple foliage is originally from New Zealand. Also known as ‘Bubble leaf’ and ‘Ramarama’, flowers in spring are small and white. Evergreen and reasonably fast growing it will reach around 2 – 3m in height and takes well to pruning. Drought tolerant once established Lophomyrtus bullata grows well in full sun to part shade. Copes well with coastal conditions and can also be grown in containers in a more formal style. L. ‘Black Stallion’ – This is a hybrid L x ralphii, new foliage is pink, older foliage turns to deep red to black. L. ‘Red Dragon’ – Deeper colored foliage than some, cream flowers. Lophomyrtus and Myrtle Rust Problems. As many species and cultivars are very attractive plants many gardeners wonder why they are not available for sale. The issue is with disease. The plant carry Myrtle Rust which is a fungal disease.It seems that some cultivars are particularly susceptible. In Tasmania a disease eradication program includes the cultivars Black Stallion, Red Dragon, Krinkly, and Rainbow’s End all on a watch list. The disease is a problem that has prompted the call for landscapers and gardeners to stop using Lophomyrtus varieties. At this time we cannot recommend this plant.